Occasionally the Super Robot Wars games do something unexpected and the handheld versions tend to do really go for it when they do so. Super Robot Wars UX had a Hatsune Miku inspired Fei-Yen and brought the Wings of Rean aura battlers onboard, in the case of BX though the roster went back a lot further. To clarify, BX is the first game in the series to not only feature Galient but also Giant Gorg. For any self respecting mecha anime fan, those are two series that are both brilliant and it is surprising that it took them this long to be featured in Super Robot Wars. 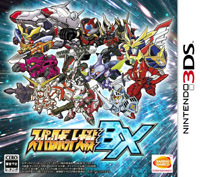 The result is probably one of the best and most faithful Super Robot Wars game in a very long time. Based on the engine used in UX, the big difference on this game is that a lot of work has gone into updating the animations and effects. The result is something that looks like a cuter though more visually stylised take on what the Z series did. In general, even though there are a fair few returning series many of the animations for them are now new and it really shows. Functionally the game retains the two-unit setup from UX and it works well. The handheld entries in this series tend to be more focused and BX is no exception. Mecha don’t have parts again and pilot upgrades are conflated with skills. This means that skills that ignore an enemy’s size are lumped alongside upgrades that simply improve a pilot’s stats. The mecha can still be upgraded obviously and these have two layers, a halfway upgrade with some stat boosts and a full upgrade with a lot more. Coupled with the pilot skills, you can end up with very powerful units without having to delve into a hugely complex system. One other interesting addition is the inclusion of tacticians. These are selected prior to each mission and give added buffs for all the units on that level. Some give you an experience boost, other accuracy but each can be picked to help maximise your strategical impact in any given battle. While you also retain various support type units, that replenish health or energy, it seems that the prior units that refill your SP are absent. Though to be fair, some tacticians partly offer this, so it may just be manifested differently this time around. The levels are also nicely done and very few of them are overly difficult in terms objectives. However, some of the secret units aren’t exactly easy to obtain on the first playthrough and it’s not clear whether you’ve obtained them or not until it’s too late. In this instance, we are referring to the Sirbine and Zwarth from the Dunbine OVA and Manon from Giant Gorg. The process to unlock these was surprisingly obtuse but the reasoning behind that became clear once they were acquired. This is because these mecha, once fully upgraded, are incredibly powerful. However, the real joy of obtaining something like Manon’s guardian from Giant Gorg is the team based attack it undertakes Gorg. While the animation for it is very nicely done, what’s more noteworthy is how endearing it is. If you have not seen the series, then we’ll abstain from spoilers here but it really pulls at the heartstrings. Thing is though, this is BX in a nutshell with the inclusion of series like Galient and Giant Gorg, not to mention the Dunbine OVA, the whole game feels like an emotional fuelled 80’s nostalgia trip. Coupled with expert pacing and balancing across the game, the whole thing comes together unlike any other Super Robot Wars game we have played in a long time. After finishing the first playthrough of BX we immediately fired the game up again and it was even better on the second playthrough, not least because we secured all the secret units we wanted. It’s also worth mentioning here that mecha from Macross 30 also make an appearance, with the YF-30 Chronos being a very good unit if used properly. While this isn’t the first time other game based mecha have made it into Super Robot Wars, it’s definitely novel to see a Macross game mecha given its time in the sun. Overall then this is probably one of the best Super Robot Wars games out there, not least due to its spot on balancing but also because it nails its 80’s fantasy mecha tone better than probably any other entry in the series. Nintendo 3DS games are region locked, so you’ll require a Japanese 3DS to play this game.